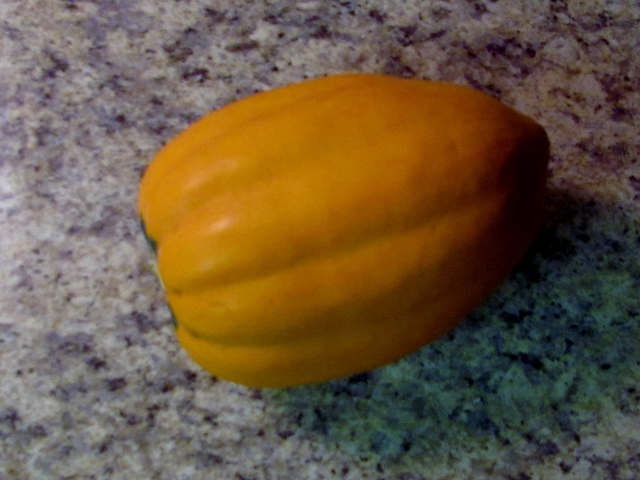 Today was the day to harvest the butternut squash from the garden. There were 10 of them! I wanted to have them already cooked when going into the freezer so I decided to go with a whole roast, scoop and mash. This is one tray out of the three total. 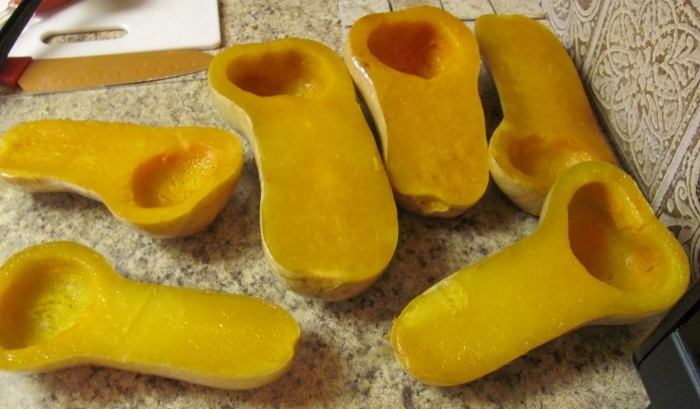 The squash were cut top-to-bottom and the seeds scooped out. I brushed olive oil on the cut side and then placed them cut side down on a baking pan. After adding a cup of water to the pan I baked them for 45 minutes at 375 degrees. After baking, I used a spatula to lift them out and place them cut side up on a board to cool. 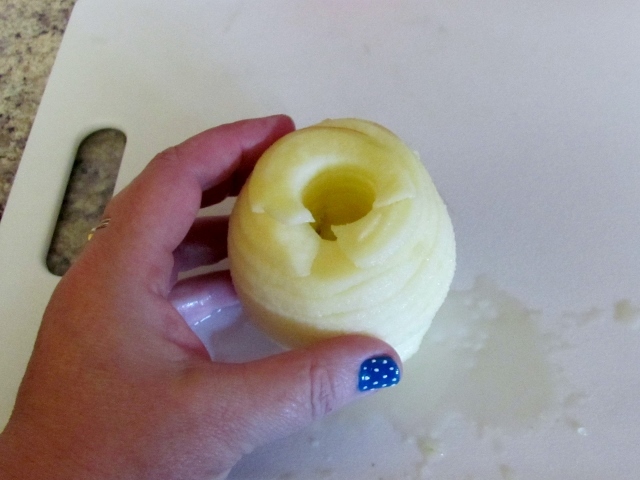 When cooled, I scooped the flesh into a big bowl and used a potato masher on it. 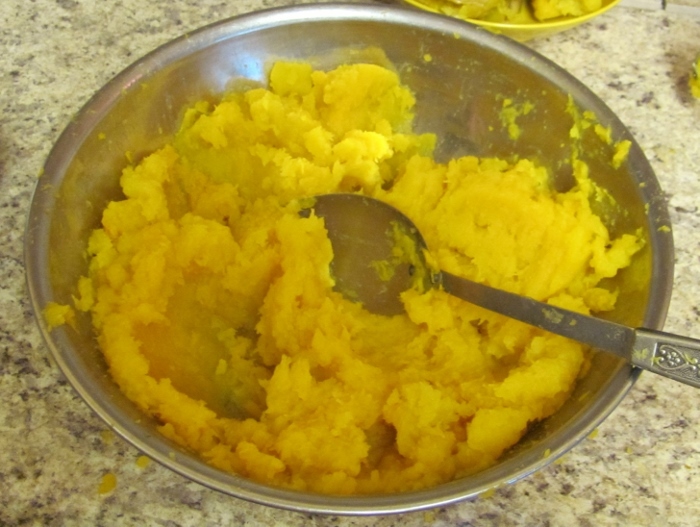 Since it will be used in a variety of recipes, I did not add anything to the mash. 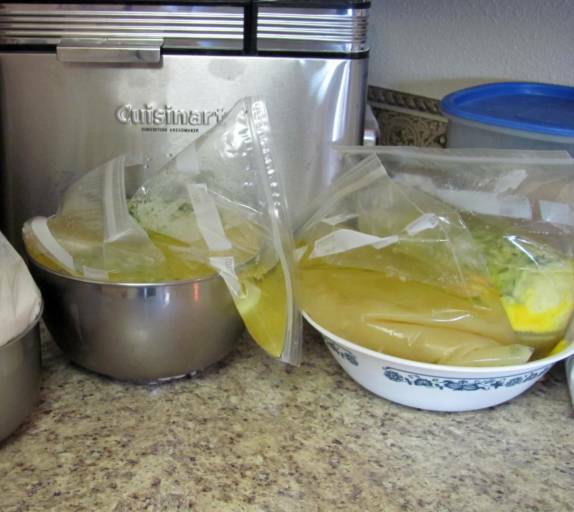 I measured out one cup portions into sandwich bags and squeezed out all the air. These were then stacked into gallon freezer ziplock bags and marked with date and contents before going off to the freezer. The final count was 19 cups of butternut squash. Yummy! I gleaned a bunch of recipes via Pinterest for what many are calling 'dump dinners'. 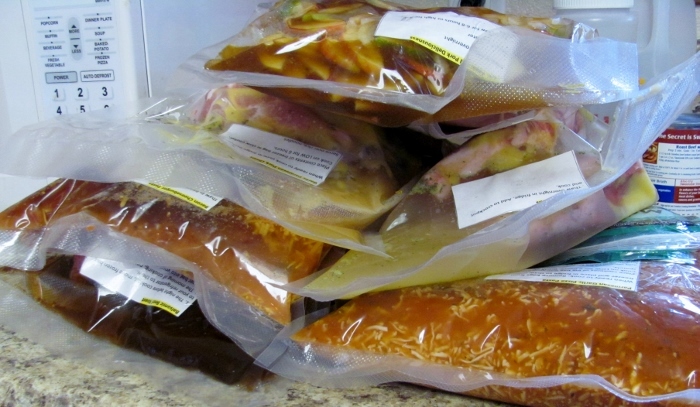 They are assembled into gallon ziplock (I used vacuum seal) bags and kept in the freezer. On the night before serving they are thawed in the fridge and then in the morning they are dumped into a crockpot to cook on low heat. Out of all the recipes I had printed I selected 25 to make and did a comprehensive shopping list (marking off the supplies I had on hand). Yay! It was 'geezer day' at the supermarket where there is a discount on store brand products for over 55 shoppers. I also had a fist full of coupons so it was the perfect day to shop. This essentially took all of my counter space so I had to do all the prep work on the surface of the range! I chopped, stirred, measured, poured, combined, sealed, and labeled. 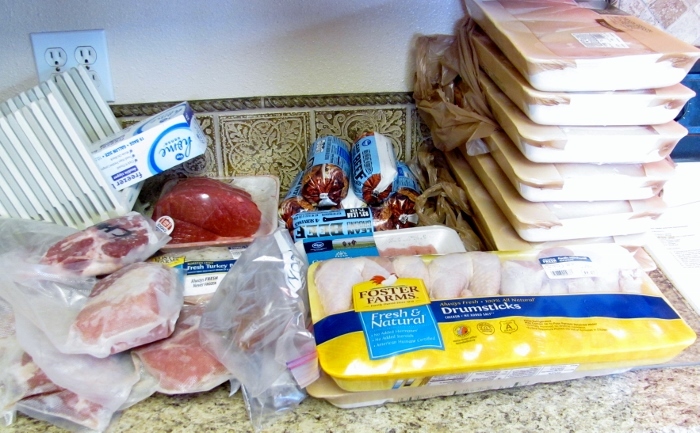 Hubby cleaned up after me and transported everything to the freezers until I was finally done - 7 hours later. Only one recipe was duplicated and I ended up with 26 dinners. 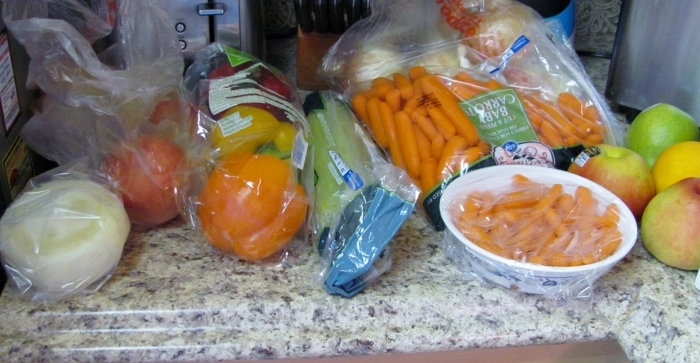 All of these meals will produce left-overs so I suppose we really have 52 meals. Next time I will limit myself to 10 recipes for a shorter day. Mid-October the tomatoes started falling off the vines whether they were ripe or totally green. I picked (and picked up) all of them, washed and sorted them and this is what I ended up with. I ended up with enough chopped tomato to make 20 loaves. Actually, not DONE because even with these 28 loaves of fine zucchini bread baked, cooled and wrapped there are three larger ones in the oven and SIX more waiting for their turn to bake! And who knows what has been going on under those big leaves in the garden when I was baking instead of picking. 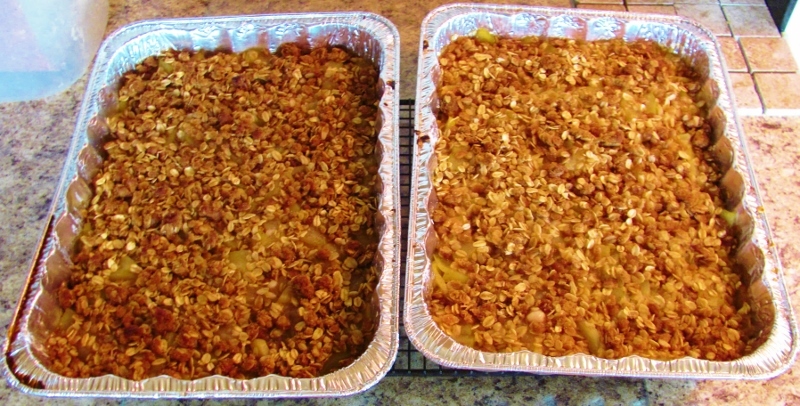 When I got tired or making mock apple pies from the zucchini I decided to make a couple of pans of mock apple crisp. I modified two recipes - one for mock apple crisp and one for apple crisp, combined the two and then added a few other refinements. I placed the crumb topping in a vacuum seal bag, covered the crisp with foil, wrote instructions on the foil, taped the crisp to the outside and put them in the freezer. When we were having a LOT of people over for a BBQ I only had to take them from the freezer, pour 1/3 c apple juice over the top, cruble the topping and spread it and they were ready to bake (uncovered). Look how nice the 9 x 13 desserts look! They were served with vanilla ice cream and, trust me, you can truly not tell they are zucchini instead of apple. For two people on my Christmas list I wanted to do some 'Gifts in a Jar' and set my goal at making a dozen for each of them. 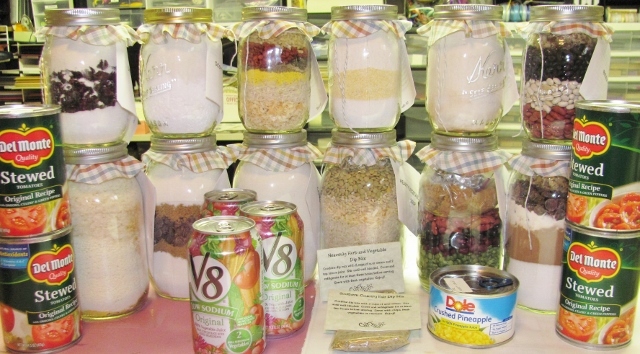 I sent not only the jars but the canned goods that they would need to make the recipes. 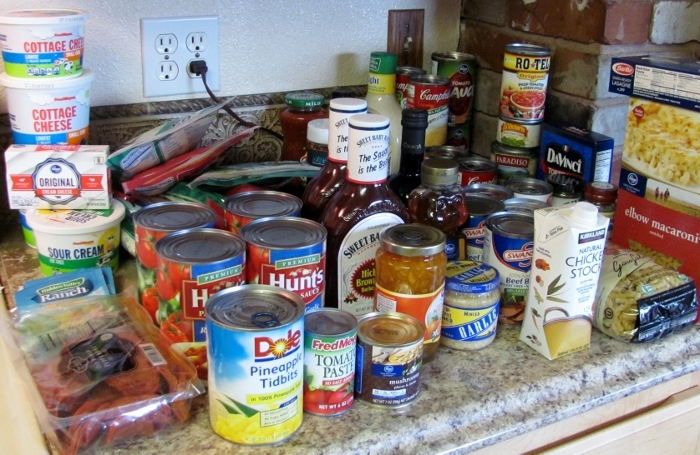 The only things not included are fresh items (eggs, butter, milk, meat) and liquid ingredients (vanilla, oil). I made half of them quart jars and half of them pint jars, depending on the recipe. I used a round of fabric over the cap before screwing on the jar ring. A fold-over tag, tied with baker's twine, identifies the dish on the outside and, on the inside lists the contents, what will need to be added, and the preparation instructions. I added a couple of packets of home-made dip mix from the farmer's market. I also printed out a 'menu' of dishes that can be used as an inventory of what is available. Yummo! Can I come for dinner? This year I was given three tomato plants and three pepper plants by a neighbor. It was a guessing game to see what varieties they were! When it all shook out I had regular, heirloom and roma tomatoes as well as two bell and one hot pepper. I have no idea still what variety the peppers were but they got a nice bright red color to them. 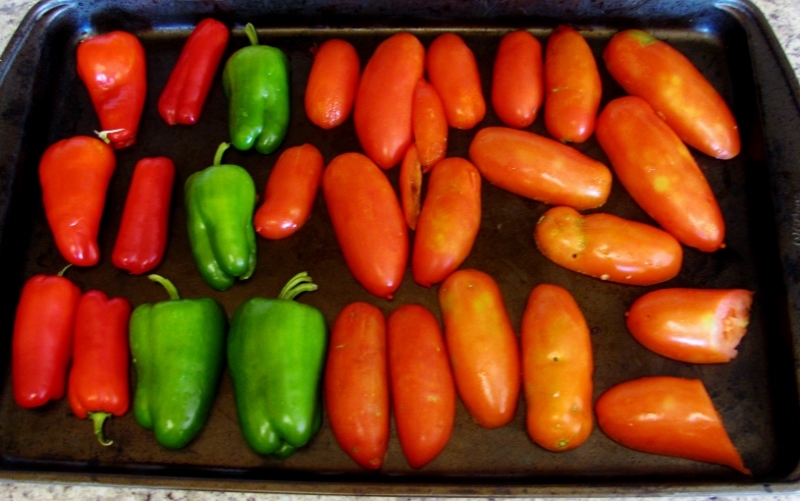 When I had collected enough ripe fruits from each of the roma and hot pepper plants I added a couple of green peppers from the same plant. To this I added the remains of the white onions from the garden and made some oven roasted salsa. These were placed in a 450 degree oven for 20 minutes. While this was roasting I added to the bowl of the food processor some Mexican oregano (1 tsp), cumin (1 1/2 tsp), plus salt and pepper (2 tsp each). After 20 minutes of roasting I sprinkled on chopped garlic and cooked another 5 minutes. This was followed by covering the pan with foil to sweat the skins off. 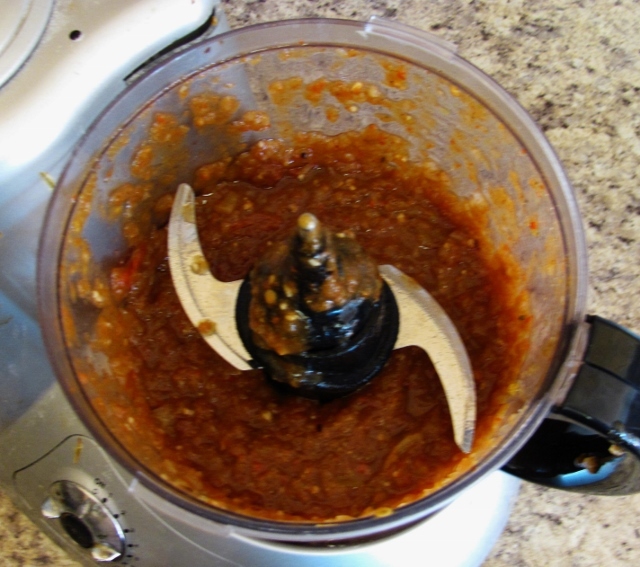 This was pulsed and the liquids added before more chopping. Oh My! The recipe said it will keep in the fridge for 2 weeks and it can be frozen. 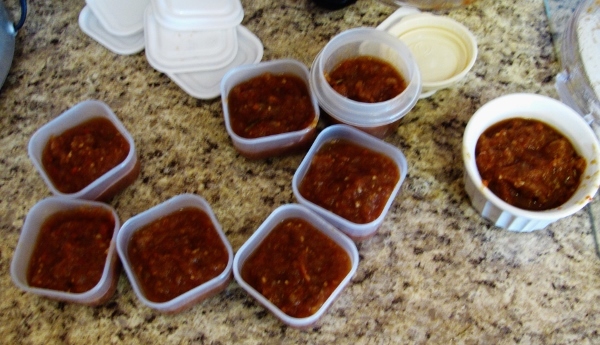 So I measured out little containers of 1/4 cup for the freezer and a little more to put in the fridge for immediate use. This may be the most ambitious I've gotten with my own garden produce. 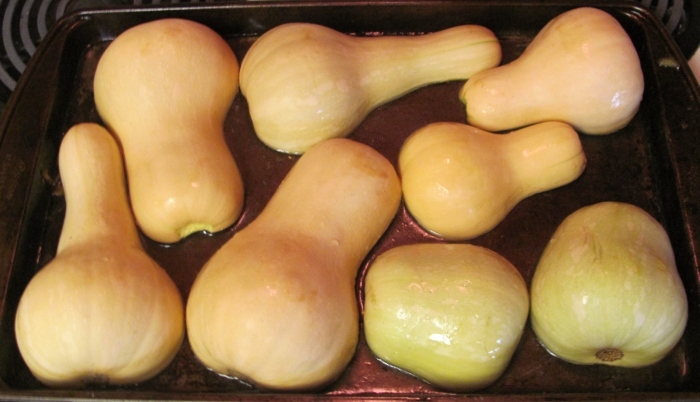 However, I am planning on trying some quickbread that uses acorn squash. This year my garden yielded a HUGE crop of squash. The crooknecks were shared but they still produced a bumper crop that had me roasting it in chunks for freezer storage. I also got an incredible yield from delicata squash and we're still enjoying that. 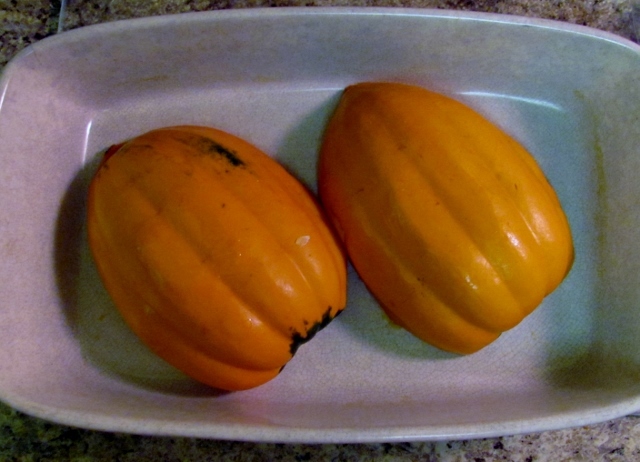 The third squash was yellow acorn which I've been investigating new ways to use. Cut the squash in half and scoop out the seeds and stringy bits. 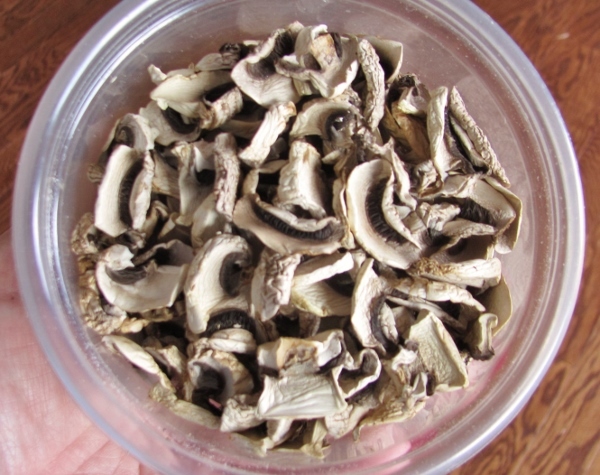 Place both pieces, cut side down, in a microwave dish. Add 1/2 inch of water and nuke for 15 minutes. Turn cut side up and allow to cool completely. 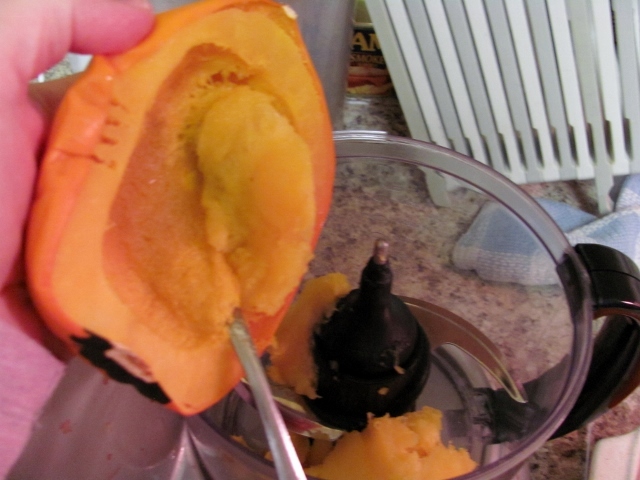 Scoop the soft squash into a blender and puree. 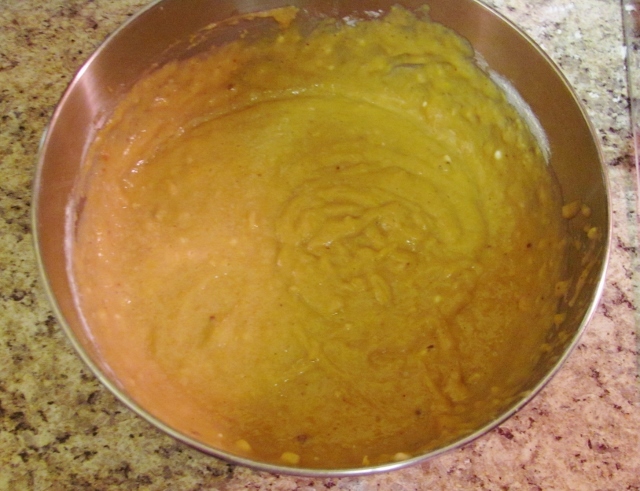 Measure out 1 cup of the squash puree, 1 cup of granulated sugar, 1/2 cup of packed brown sugar, 1/2 cup of applesauce, and 1/2 cup of egg substitute (Egg Beaters, for instance). Can use 2 eggs instead, if you wish. Measure out 1 1/2 cups white flour, 1 tsp ground cinnamon, 1/2 tsp ground ginger, 1/2 tsp ground ginger, 1 tsp baking soda, 1/2 tsp baking powder. You may elect to add 1/4 tsp salt but I leave it out. 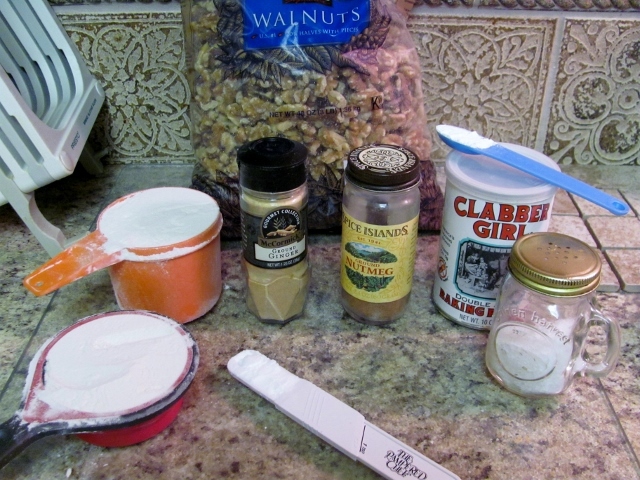 Add these dry ingredients to the wet slowly while stirring. 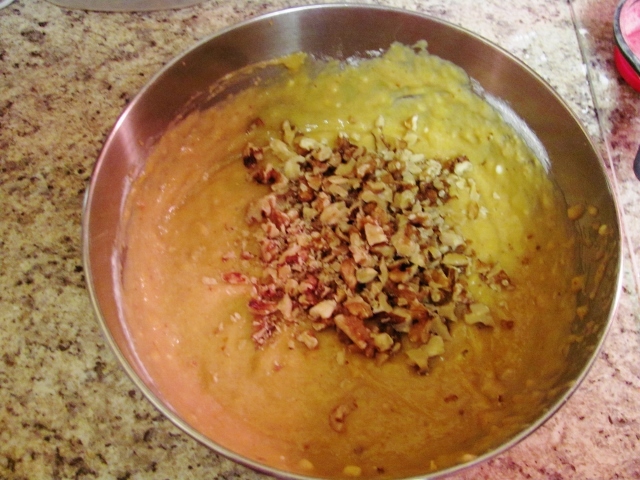 Add 1/2 cup chopped nuts and fold into batter. I used walnuts but it would be good with pecans as well. 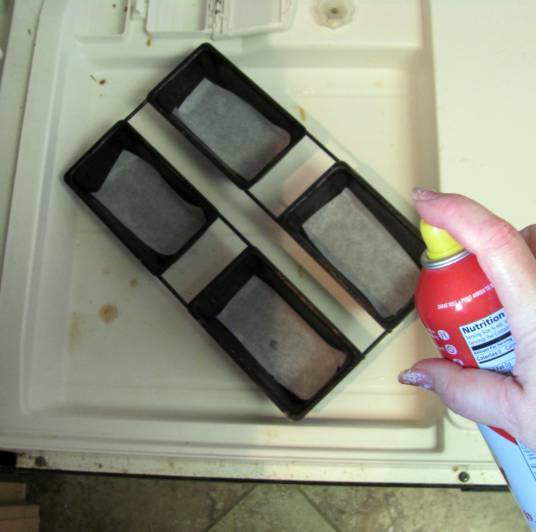 Use baking spray to prepare mini-loaf pans. Divide batter between four pans and bake for 45-50 minutes. Turn out loaves onto a wire rack to cool. The first time I made this recipe I used a single full-size loaf pan and baked it for 60 minutes. Many more squash left - will be making more of this bread. 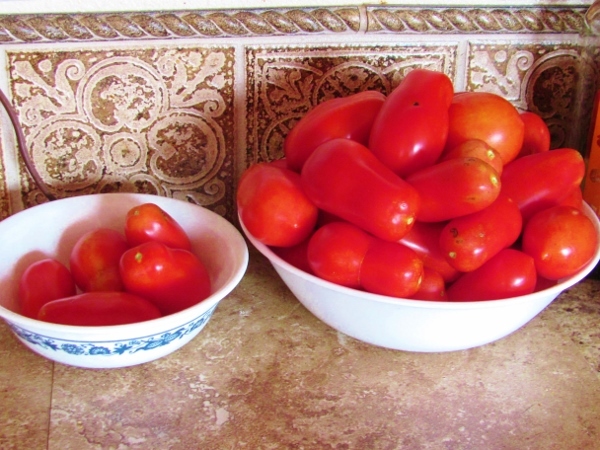 An over-abundance of tomatoes in the garden, all ripening at once, led me to the decision to try making some pasta sauce of them. 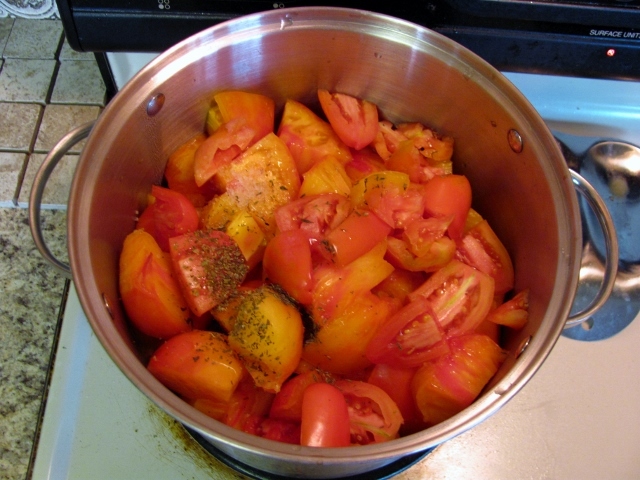 The tomatoes I had to work with were heirlooms with an orangy coloring so the sauce is not a dark red as expected. I cruised the web to read up on the process and recommended ingredients. Then I just went off on my own and made it up as I went along. I started by cutting the tomatoes into chunks - these were HUGE fruits, up to 6 inches across! 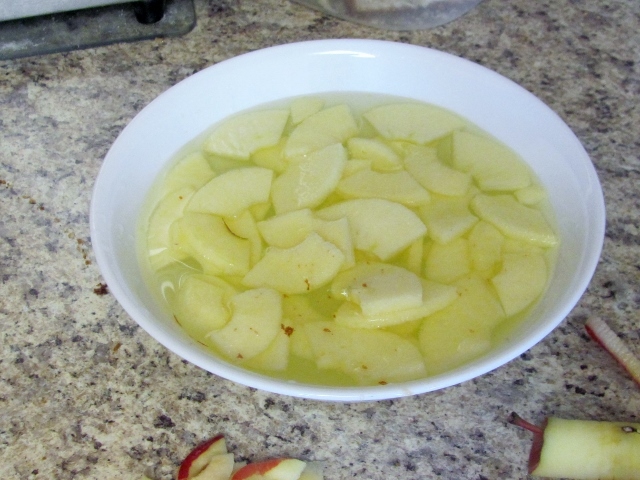 The chunks were placed in a big stockpot and some white wine added. I also added oregano and thyme, some salt and pepper. While this cooked down on low heat I put two cut onions and some garlic into the oven wrapped in foil. 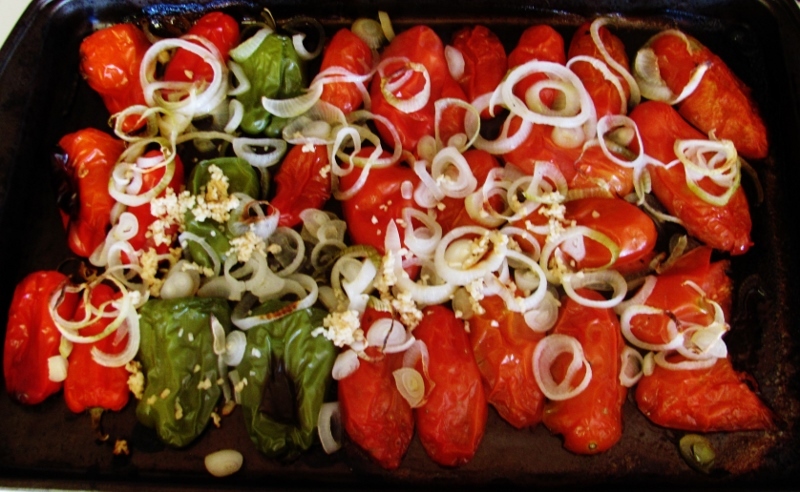 I roasted these until they were tender and then tossed them in the pot with the tomatoes. 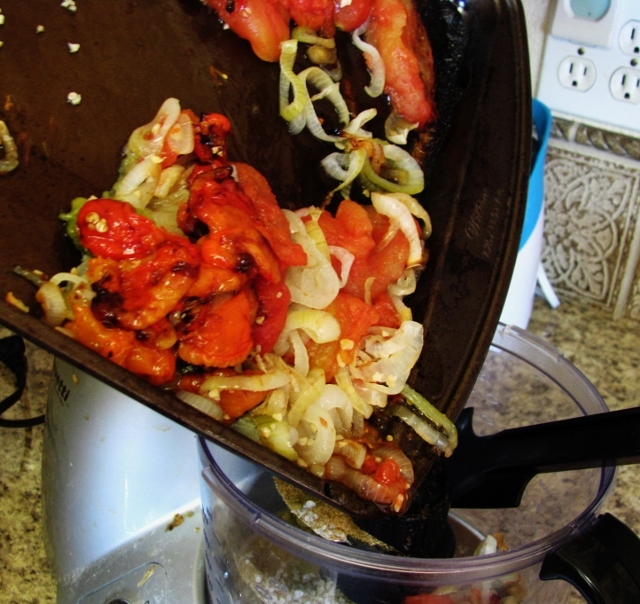 I used a potato masher to break up the tomatoes and continued cooking. 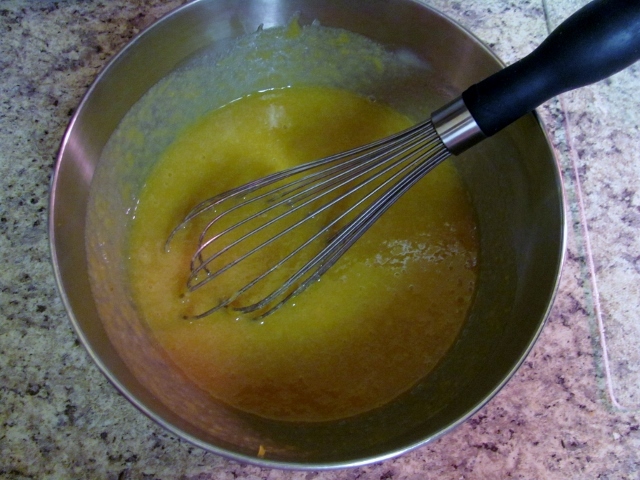 When everything was pretty 'loose' I scooped some into a collander and pressed the pulp through. This left behind the tomato skins which were then discarded. 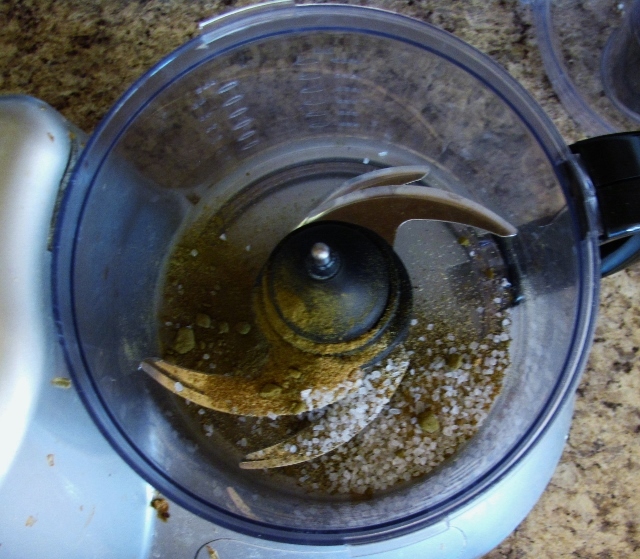 All the juice and pulp was run through the food processor to puree it and then returned to the stock pot. At this point I added more spices, some garlic powder and some chicken boullion powder. A little paprika helped add red color to the sauce. This was then allowed to simmer for a couple of hours until reduced to about 1/3 of the original volume. 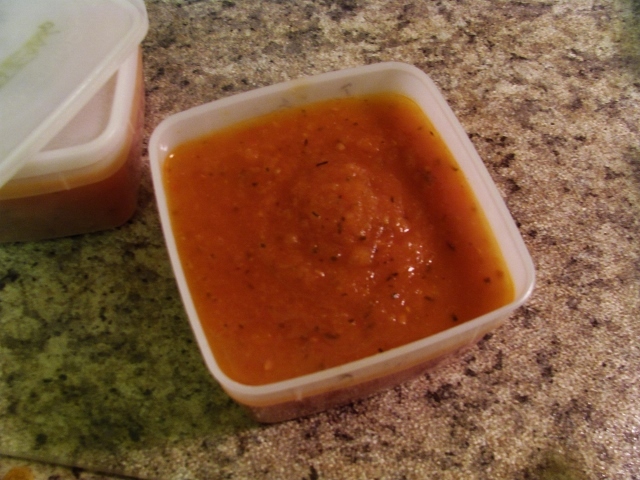 The result was 5 pints of pasta sauce which I packaged for the freezer. This will make a tasty winter treat over spaghetti - perhaps with a little ground beef added in. 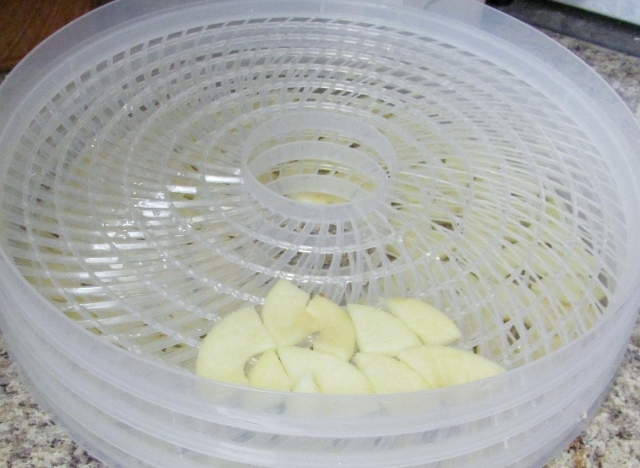 I really love the dehydrated apples slices I've been making but often delayed making them because I dreaded all the peeling, coring and slicing it takes. To the rescue, a chance encounter with an awesome kitchen gadget. At slightly less than $20 I was enthralled. 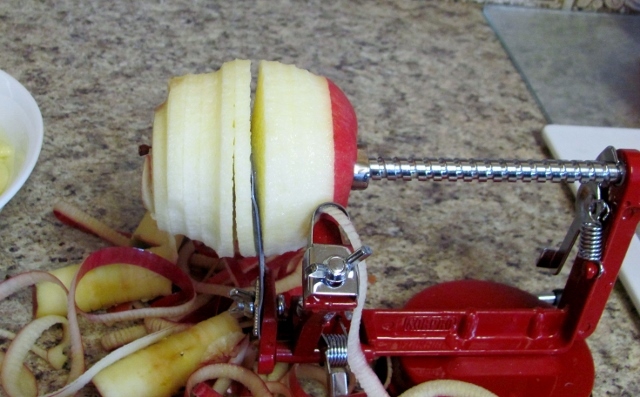 Start cranking the handle and your apple is peeled, cored and spiral sliced all in one step. One apple takes about 15 seconds. The most time consuming part of the process is now laying out the slices on the trays. 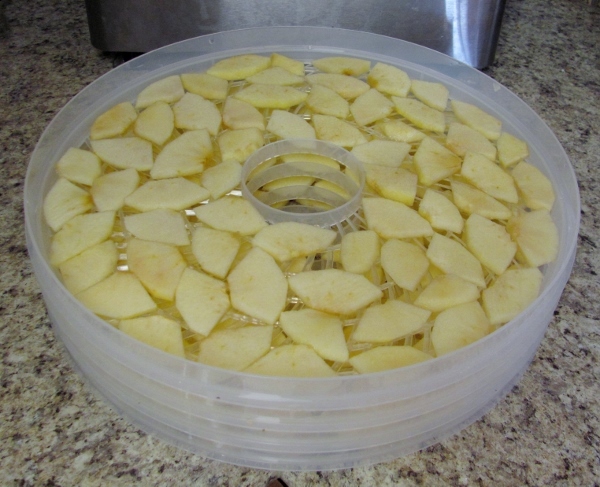 Tomorrow I will have a brand new batch of dehydrated apples to munch. 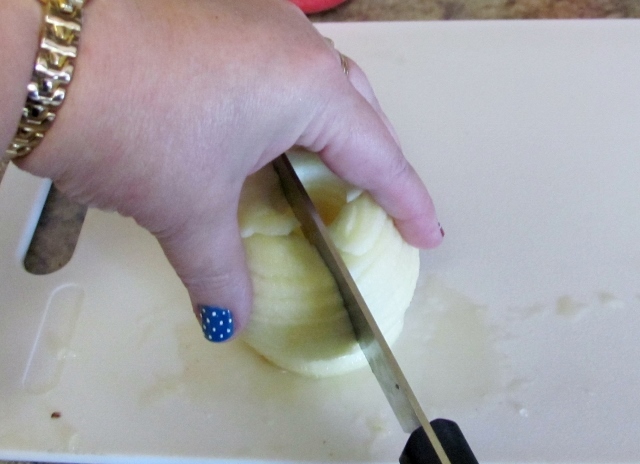 I used it to peel potatoes for a salad the other day, also. 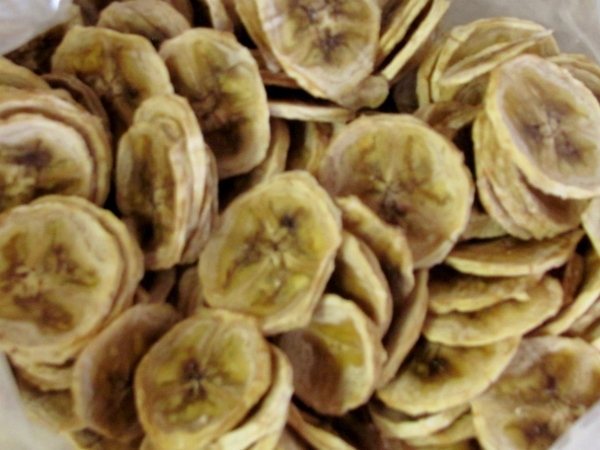 It will peel only, peel and slice and core, core and slice. 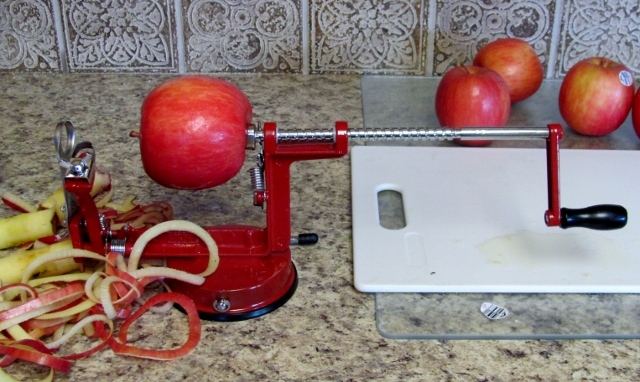 No peel and slice without coring as the corer and slicer are one unit. This tool was definitly worth the price! 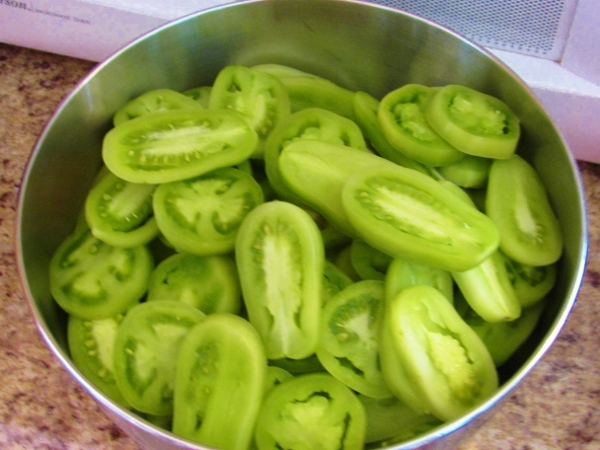 Green tomatoes yielded 24 loaves of delicious bread. Yes I CAN count - we already ate one warm from the oven! 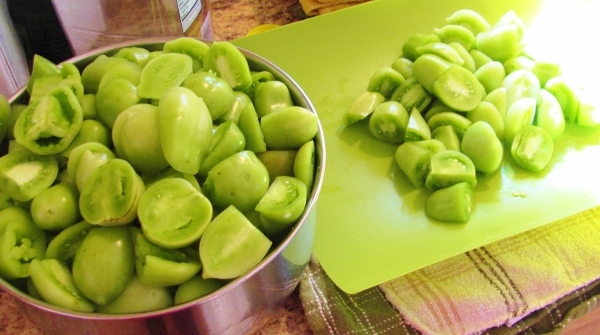 My delicious recipe uses green tomatoes and tart apples (I used Granny Smith). I used the same marathon baking method as for my zucchini bread (double batches with dry ingredients in one gallon ziplock and wet ingredients in another - combine in the mixer). 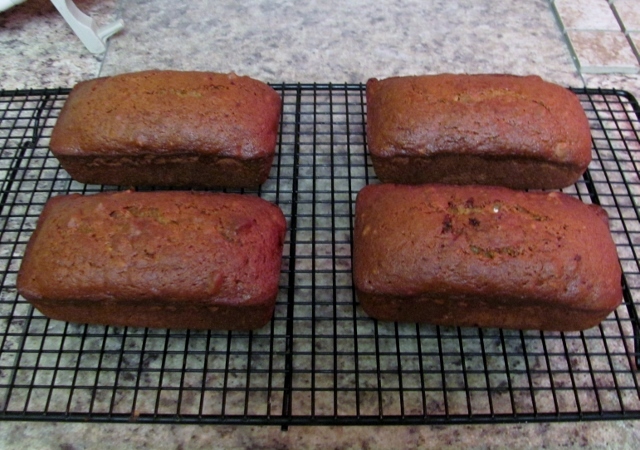 I also added two mock apple (zucchini) pies to the freezer along with these loaves of bread. Every time I visit at my son's house I come back inspired (challenged) by my multi-talented daughter-in-law. This time I was inspired to try making no-knead artisan bread. Awesome stuff to eat - easy to make. It is a wet dough that keeps in the fridge for up to a week while you take off portions to bake up fresh. I baked two loaves right away and kept two in the fridge to bake in the next few days. I will defininately be making more of this! Sometimes the neighbors are overly generous with their zucchini (OK, they ALWAYS are). This year I was given some real whoppers so I had a marathon baking session. I would like to share some of my favorite recipes and methods here. First up is a new-to-me recipe for a pie - yep, a zucchini pie! It is mock-apple and it truly delicious. There is NO telling this is zucchini, either. 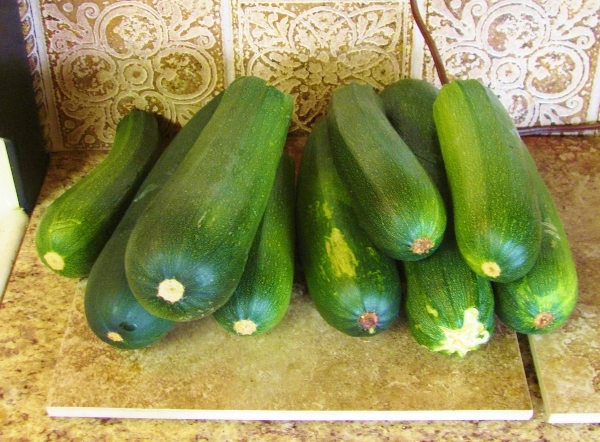 Peel very large zucchini, slice lengthwise, remove and discard seeds. Slice like apple. 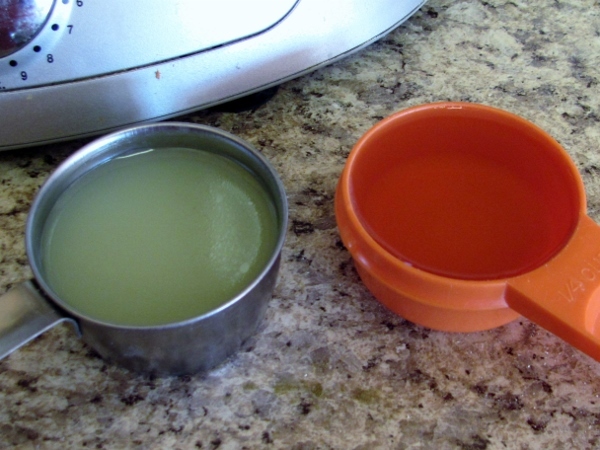 Add to ¼ cup lemon juice and ¼ cup water in a saucepan and bring to a boil. Simmer 10 minutes until just tender. Drain and cool. Add remaining ingredients and place in unbaked pie crust in a 9-inch pan. Cover with second crust and flute and seal the edges. Cut slits for steam. Bake at 350 degrees for 50 to 60 minutes until top is browned. 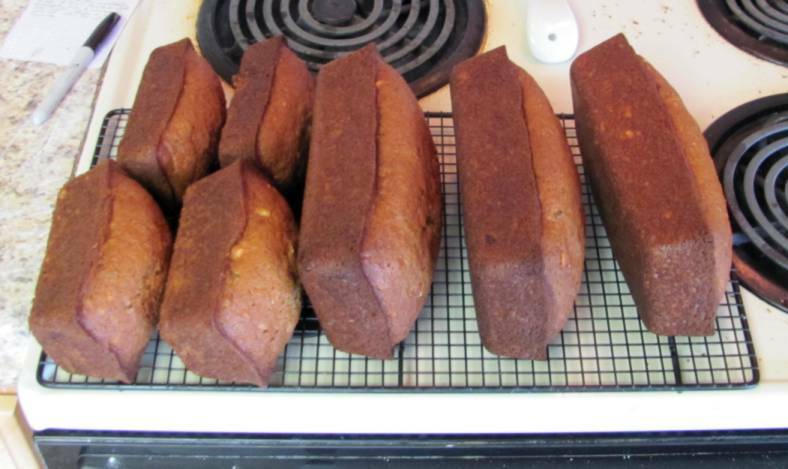 Then I made up 22 full-size and 8 mini loaves of zucchini bread. 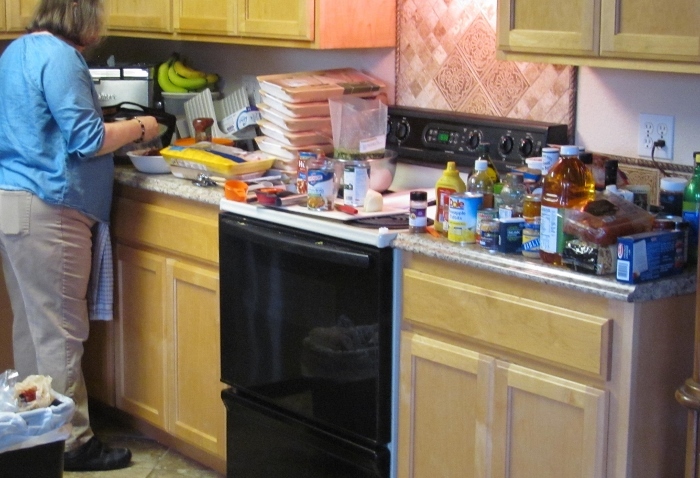 I have three recipes that I use so that we have some variety and I always double the recipes. For a marathon session I get out some gallon ziplock bags. 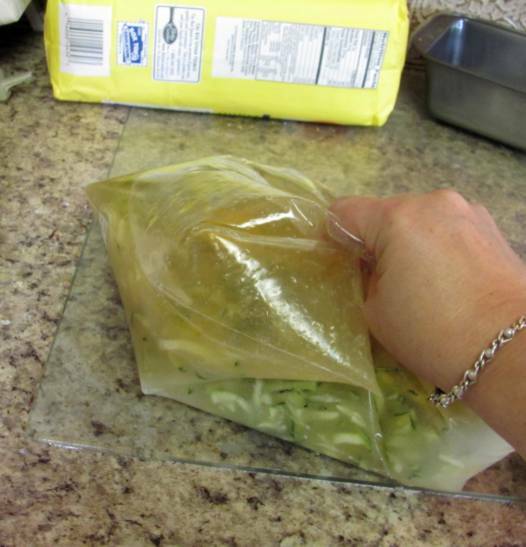 For each recipe I place all the wet ingredients, including the sugar and zucchini in one big bag. I measure out all of the bags at once (for this session I ended up with 6 bags of double recipes. The number of bags I have is entirely dependent on how much zucchini there is. I measure that into each bag FIRST and build the rest of the recipe around it. I label the bags with a marker as to which recipe they are. Then I take another set of bags and measure out all the dry ingredients, including the nuts. These also get marked with the recipe name. 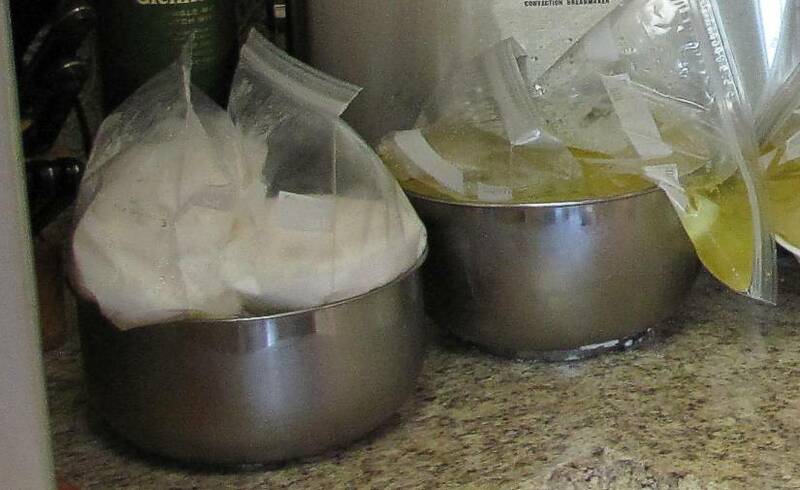 Now I just match up bags of wet and dry by recipe and set them aside. Now I'm ready to mix up some zucchini bread. 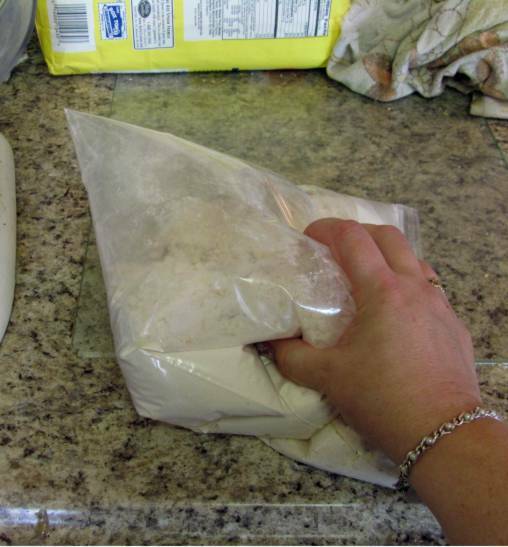 I massage a bag of wet ingredients to get them unstuck from the sides of the bag. Pour that into the mixer bowl and start it up on low speed. Then I massage and roll around a bag of dry (in place of sifting). With the mixer running I feed the dry ingredients into the bowl gradually. I leave the mixer running while I spray the pans with non-stick spray. I read a great idea on another blog the other day and tried it out... place the pans on the door of your dishwasher. All the overspray goes on the door and is cleaned up when the dishwasher is run. While the loaves are in the oven I wash the mixer bowl, paddle and spatula. That way I'm ready for the next batch to be mixed up. When the loaves come out of the oven I turn them out to cool on a wire rack. They stay here until the next batch comes out of the oven. 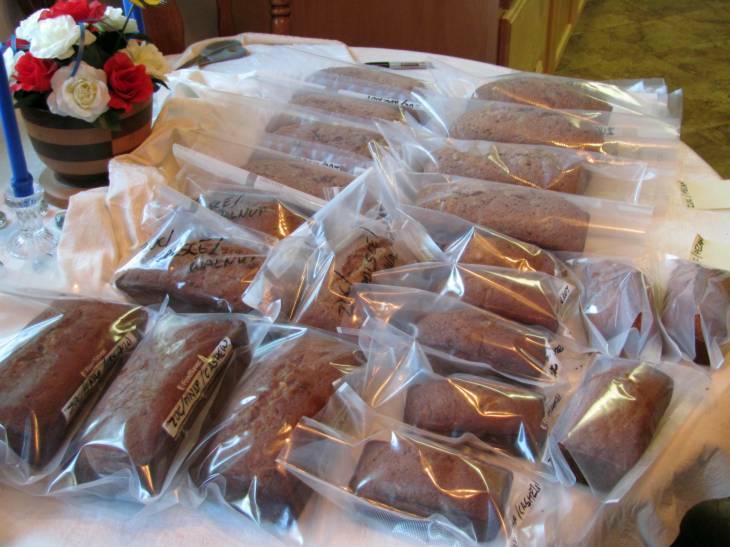 When the loaves are cooled to this point I slip them into vacuum seal bags but leave the ends open. I use a marker to write the product name on the bag. When they are completely cooled I will seal them with the vacuum sealer. Here is the layout partway through the marathon. At this point there are 4 more loaves in the oven and 4 still to mix up. In another bowl, measure and combine flour, soda, baking powder, salt, cinnamon, nutmeg, and nuts. Pour all at once into batter. Stir to moisten. 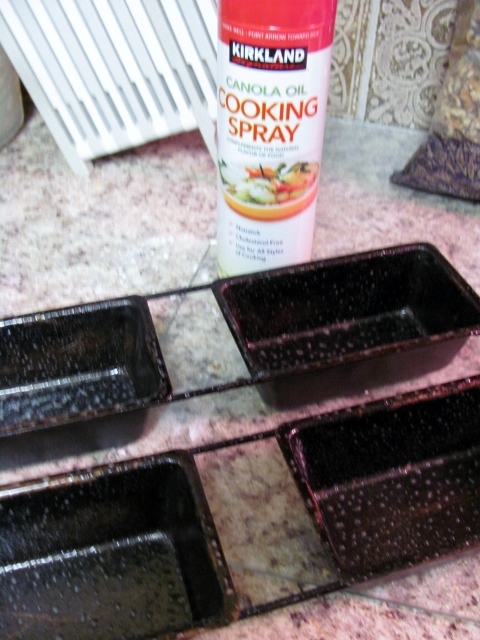 Pour into greased loaf pans. Bake in 350 degree oven for 45 minutes to 1 hour until bread tests done. Cool for 10 minutes before turning loaf out to cool on rack. For a ladies' event at church I offered to make a cake for dessert. 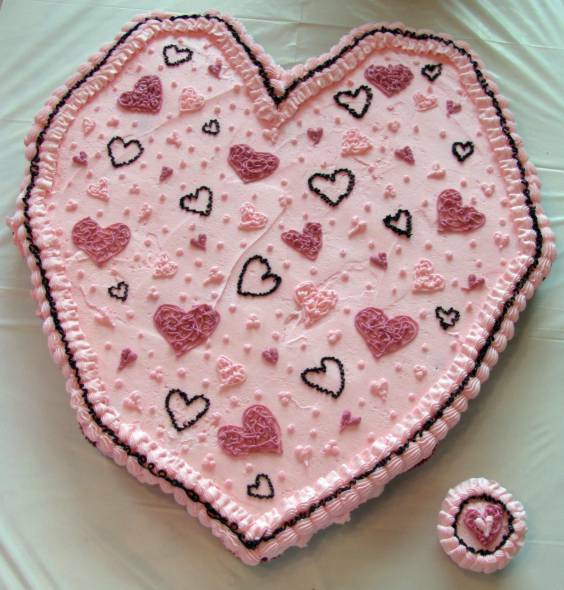 The theme is Where the Heart Is so a heart cake was in order. 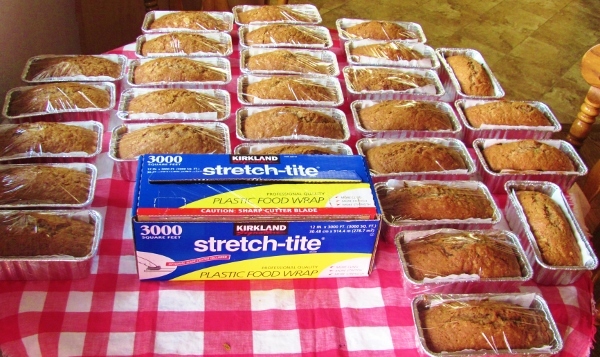 In order to make it easier to serve it is actually 48 cupcakes (red velvet), arranged and frosted as one unit. The extra off to the side is because the heart really only takes 47 cupcakes! The fact that the cupcakes dictate the design also accounts for the 'wonky' outline of the heart. The colors and design were matched to a piece of fabric that was selected for the table centerpieces. 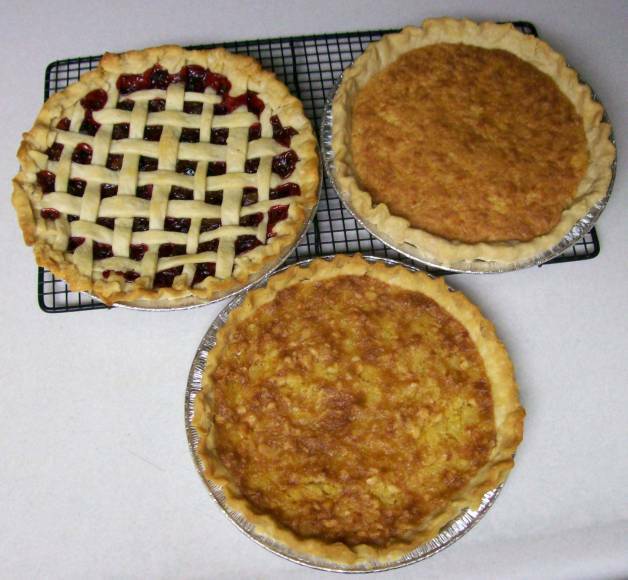 Three pies, hot from the oven, ready for a trip to a pie auction. Together, they sold for $100! Just in case YOU want a pie worth $30-$35 I'll give you the recipies for them. They are CRANBERRY (upper left), COCONUT MACAROON (upper right), and PINEAPPLE-MACADAMIA (lower). 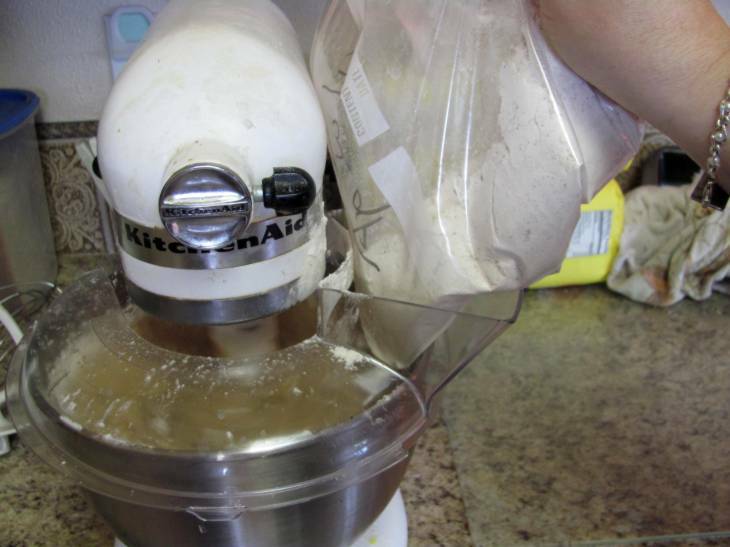 In bowl combine 1 cup all-purpose flour and 1/4 cup vegetable oil. Stir with a fork until blended and crumbly. Sprinkle with 2 tablespoons chilled water. Sitr until it comes together and forms a ball. 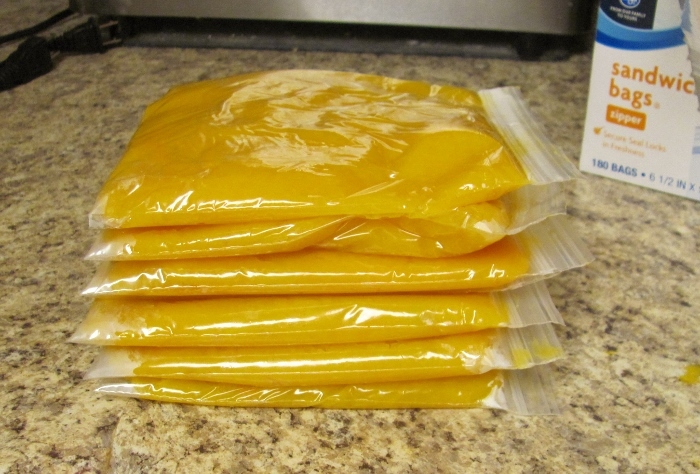 Wrap in plastic wrap and place in fridge for 10 minutes. When chilled roll out between two pieces of plastic wrap. Combine in a saucepan and bring to a boil. 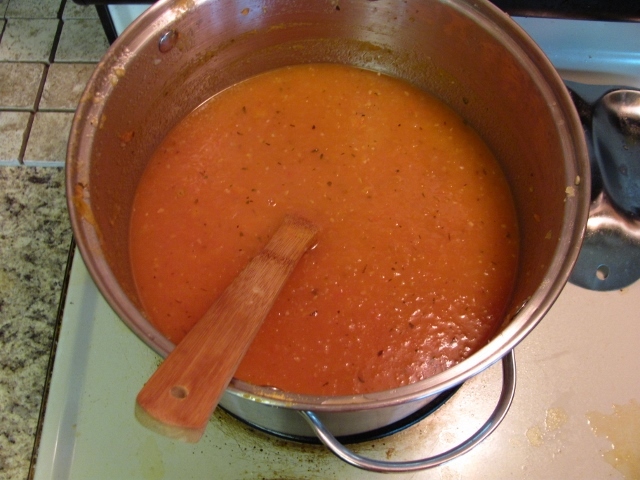 Lower heat to medium low and boil, stirring often, for 10-15 minutes, till thickened. Remove from heat and stir in 1 teaspoon vanilla extract. Pour into a 9" unbaked pie shell and dot top with 2 tablespoons of butter or margarine. Add a lattice top as this pie needs lots of venting. Bake at 450 degrees for 10 minutes. Then turn oven down to 350 degrees and continue baking for another 35 minutes. Mix all ingredients. Pour into a 9" unbaked pie shell. Bake at 325 degrees about 1 hour, till golden brown. Cram together the butter and sugar. Add eggs one at a time and continue beating. Add corn syrup, flour, extract, pineapple and nuts. Pour into 9" unbaked pie shell. Bake at 350 degrees for 40 to 50 minutes, until firm. I didn't know whether to code the topic of this 'in the kitchen' or 'in the garden'! This plate was part of our dinner the other night and the surrounding items were sent to the refrigerator for later consumption. All of these were picked from the garden barrels within an hour of this photo! So, the garden was a success! 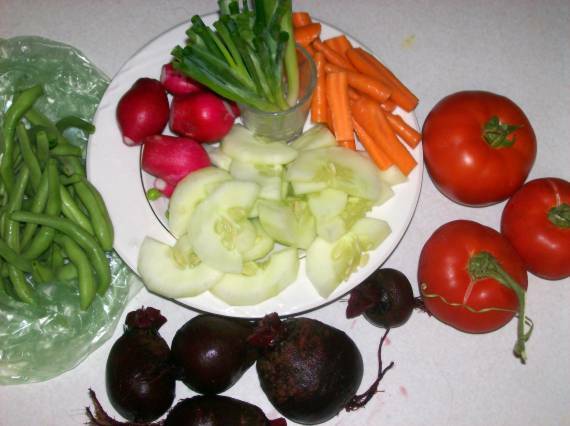 Here we have (clockwise on the plate and then surrounding it) radishes, green onions, carrots, cucumber, green beans, tomatoes, and beets. The tomatoes are from those cheater plants. On the left edge of the plate you can see just one pea that DH did not snack away while I was preparing the shot. Other garden successes not on tonight's menu - spinach, lettuce, cherry tomatoes (yet to ripen), white onions. Peanut-Apple Salad with dressing of balsamic vinaigrette and honey served on a bed of lettuce leaves with a sprinkling of shredded cheddar cheese. Veggie Tray of grape tomatoes, cucumber slices, baby carrots, and radish flowers. Breakfast for 4 of us was Ham and Cheese Omelets and Caramel Pecan Cinnamon Rolls. Everything was very tasty and I thought I’d share the recipe for the Cinnamon Rolls and the Apple Crisp that I developed by combining and making changes to some others that weren’t quite what I wanted. In bread maker pan add the following ingredients in the order listed – ¾ cup plus 2 tablespoons of lukewarm water, 2 tablespoons softened margarine, 2 ½ cups bread machine flour, ¼ cup granulated sugar, 1 teaspoon salt, 1 teaspoon bread machine yeast. Set bread maker to make dough only. While it is being processed by the bread maker stir together 6 tablespoons softened margarine, ½ teaspoon salt, ½ cup brown sugar. 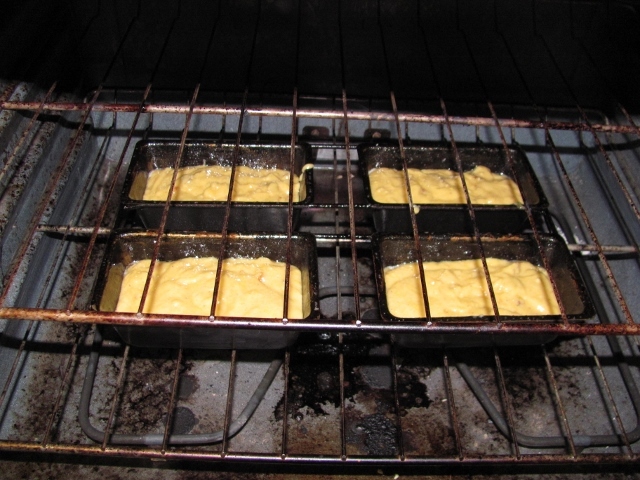 Spread evenly in the bottom of a buttered 9 x 9 inch square pan. Arrange 36 pecan halves in the pan. Set aside. 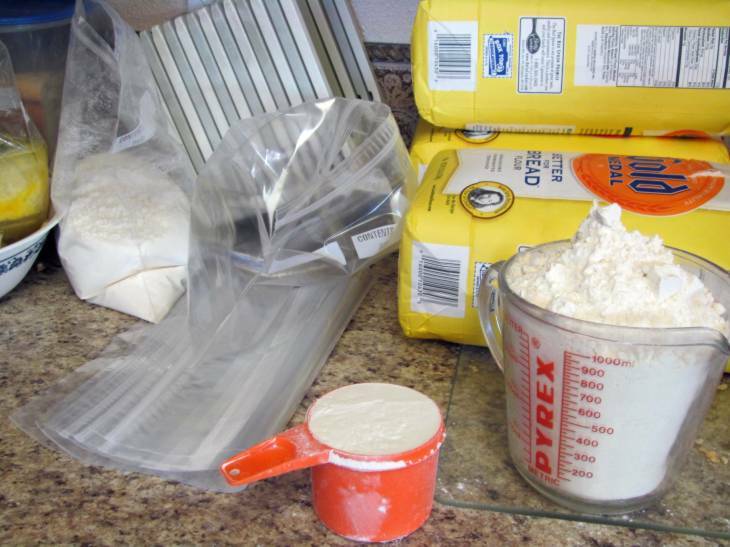 When the dough is ready, turn out onto floured surface and use floured rolling pin to roll into a rectangle 13 x 17 inches. 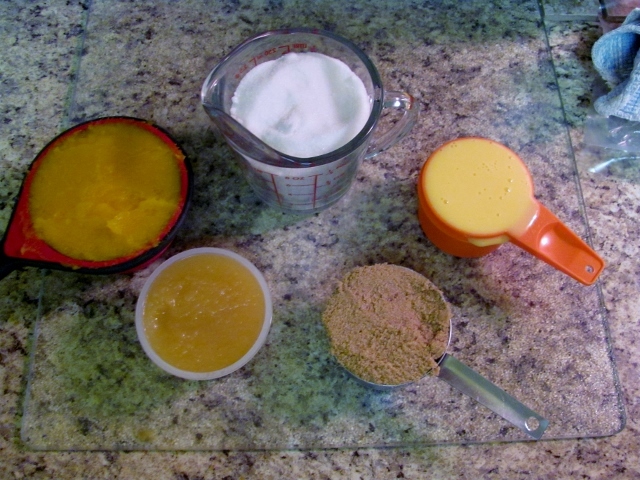 Mix together ¼ cup softened margarine, ¼ cup granulated sugar, 1 teaspoon ground cinnamon, ¼ teaspoon ground nutmeg. Blend well and spread evenly on the rolled out dough. Sprinkle with ½ cup chopped pecans. Roll from the narrow end up the length. Dip serrated knife in flour and cut dough into 9 even sections. Place into the 9 x 9 inch pan on top of the pecan halves. 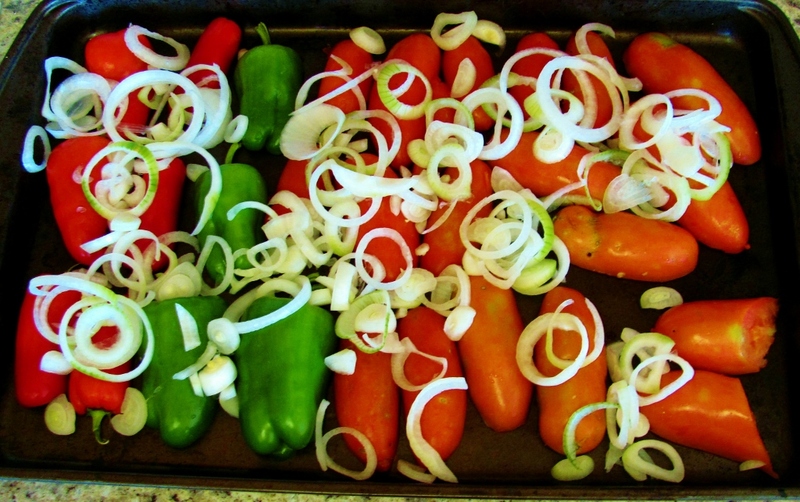 Set pan in warm place until doubled in size – roughly 1 hour. Bake 35 to 45 minutes in oven preheated to 350 degrees. Immediately invert pan so rolls will release and the caramel drips over them. Preheat oven to 425 degrees. In small bowl combine 1 cup regular rolled oats, 2/3 cup packed brown sugar, 2 tablespoons flour, 3 tablespoons melted butter or margarine, 3 tablespoons apple juice. Mix well and set aside. Into a 9 x 13 inch baking dish, slice 8-10 cups of peeled apples - I use a mix of Honeycrisp, Gala, Braeburn, Fuji, or Granny Smith. 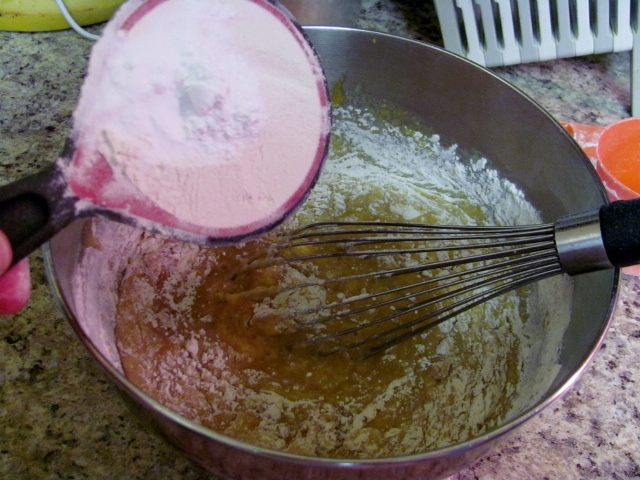 Make a mixture of 2 tablespoons granulated sugar, 1 tablespoon cornstarch, ½ teaspoon ground cinnamon and a dash of salt. Sprinkle this over the apples. Pour 1/3 cup apple juice over both. Then sprinkle the whole with the oatmeal mixture and bake for 25 minutes or until bubbly and golden brown. Let stand for at least 15 minutes before serving.